One of the great Sunday morning pleasures is to go to ‘Les Halles’, the fantastic indoor Market in Avignon. More than just a shopping habit, going to the Market is a way of life here in Provence and we take even greater pleasure in Spring and Summer, when the colourful Provence fruits and vegetables hit the shelves. 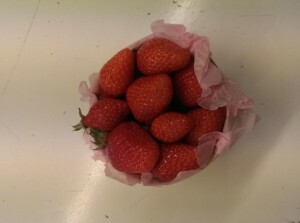 For the past 2 weeks, the Queen in the Provence kitchens has been the sweet and juicy Carpentras strawberry. Every year from March until June, the shops and markets displays take on the deep red colour of this delicate strawberry, known as the best in France. The region of Carpentras, a town located about 20km from Avignon, is deeply attached to its traditions: truffles, strawberries and melons among other sun-kissed fruits and vegetables grow extremely well in this area thanks to the unique ‘Terroir’ (a combination of soil, climate and local savoir-faire). The carpentras strawberry is one of those delicacies you should not miss while in Provence, whether you see it on the menu of a nice restaurant and on the market shelves: Cléry, Gariguette or Ciflorette are the most popular ones. All three offer a different experience: the Cléry is big and juicy, the Gariguette is soft and delicate and the Ciflorette is sweet and refreshing. They are all delicious; it is a matter of taste! Although eating freshly-bought strawberries right from the basket is a delightful experience, I wanted to share some simple recipe ideas that call for this lovely spring fruit; they are a nice change to the classic (but decadent) ‘Tarte aux fraises’ or ‘fraisier’. Give it a go if you resist eating them all on your way home…. Perfect as an afternoon treat or a light dessert, a chilled soup is a wonderful way to bring out the flavours of the strawberry. The mint adds a refreshing touch and combines well with the sweetness of the fruit. Clean and hull the strawberries before placing them in a blender. Blend until you get a smooth purée. Pass the purée through a sieve then add the lemon, sugar cane and mint leaves. Keep 2 hours in the fridge before serving. Who said strawberries were only for desserts? A ‘fruité noir’ olive oil will work really well in this recipe. This olive oil is made with ripe olives which have been stored 4/5 days before pressing to develop a rich, earthy olive flavour. This oil is intense with hints of tapenade. Gently crumble the goat cheese and blend with a little olive oil, salt & pepper. Clean the mixed salad leaves and strawberries. Hull and cut the strawberries into quarters. Take four plates and start plating up with the mixed leaves, then add the strawberry quarters, sprinkle the crumbled cheese and finish with a few toasted pine nuts. Finally add the salad dressing on the top: a little olive oil, balsamic vinegar and seasoning to taste. 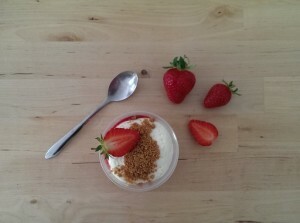 So now head to your nearest shop/market to get those little red beauties and try one of the recipes!